Happy Spring! This salad, with its amazing combination of flavors and textures, works just as well as a main course as it does a side dish. Preheat the oven to 400, bring a pot of lightly salted water to a boil, then cut a peeled and seeded butternut squash into half inch cubes and toss with a little bit of olive oil, salt, and pepper. Stir a half a cup of wheat berries into the water and simmer until tender, about forty five minutes, then drain well. Lay the squash cubes out on cookie sheets with parchment paper and roast for approximately thirty minutes…you want them firm, not mushy. For the vinaigrette combine a half cup of olive oil, a quarter cup of red wine or cider vinegar, a minced shallot, a tablespoon of Dijon mustard, and salt and pepper to taste. 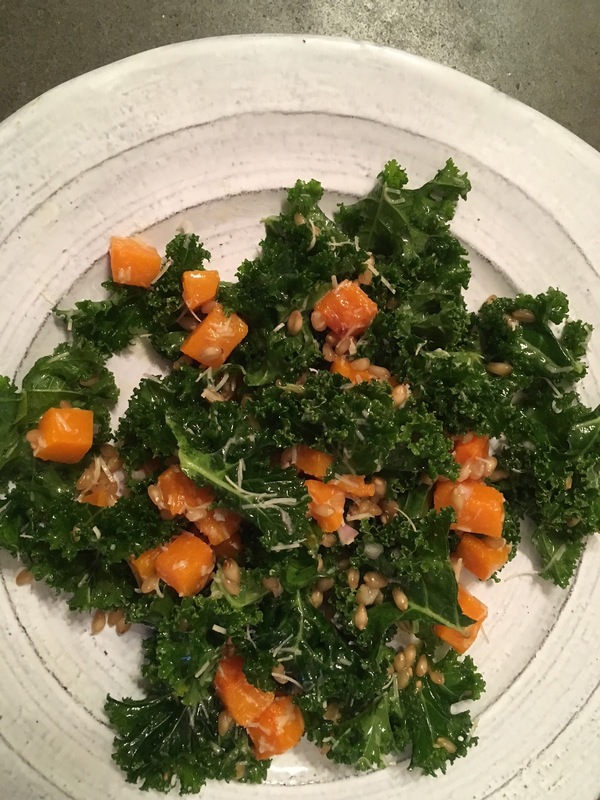 While the wheat berries and squash cool, toss your stemmed and chopped kale in a large bowl with a little bit of the dressing to soften the leaves. When you’re ready to serve, add the other ingredients to the bowl, mix with more dressing, then salt and pepper to taste.